Great work, quality service and quick processing! "I purchased a Warhol style 4 panel portrait for my husband's birthday and just wanted to let you know that when he opened it yesterday he was thrilled. It is absolutely beautiful and a wonderful gift. Thank you for your great work, quality service and quick processing of my order." Select from a wide variety of art styles. One or several photos and place your order. Send us your photo by mail or email and we’ll provide you with a proof in 3-5 days. Request as many free changes as you need and approve it! In 10 days or less you will receive your artwork. We can frame it for you, or you can choose to get it rolled. Our 100% money-back guarantee is got your back. 100% Money-back guarantee. No risk. We are so confident that you’ll love your professionally crafted All Pop Art portraits that we back up all of our products with a complete money back satisfaction guarantee. No questions asked. 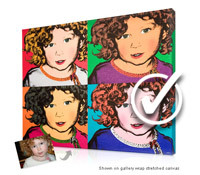 All of our portraits are produced in the United States using premium-quality materials and advanced UV resistant inks. They won’t crack, fade or chip. Everlasting masterpieces for your walls. Lifetime guaranteed. Your Art, Your Way is our motto and we’re determined to give you all the attention you need for a gratifying, effortless experience and worldwide service. That’s why our customers rate us #1. Pop Art was a movement that emerged in the late 1950s in England and the United States as a reaction against Abstract Expressionism art, which they considered empty and elitist. The common element in the pop art movement is not a similar style or technique in the composition of the artwork but a common theme among all of the pieces produced in this era. The common theme is the consumer mass market and the commercial world. 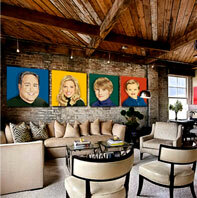 Pop Art uses familiar images in a different sense to achieve aesthetic posture with them or express a social critique. As its name suggests "Popular Art" takes after people's interests and themes. "In the future, everyone will be world-famous for 15 minutes." 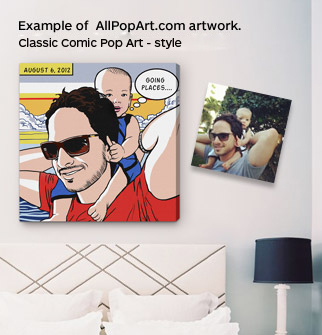 -AllPopArt.com makes you and your loved ones subject of the painting. Now, for almost a decade, we've been making amazing art from your photos. 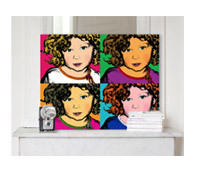 It feels like yesterday that we first dabbled with our now bestselling Warhol pop art style; over the years, you've shared your priceless family memories with us—stories of happiness, achievement, love, and sometimes loss. When we receive your photos, we know there is a story behind it and that it means something very special to you. After carefully reviewing your order, we get to work by creating a unique piece of art, just for you. We scout the best finishing materials, eco-friendly and sustainable. We handcraft every print and every frame in our custom frame shop, so you can enjoy your art in any room of your home, for many years to come. So go ahead and start a free photo consultation, our art consultants are always available to speak with you during business hours. And, if for whatever reason you don’t love your personalized art, return it for a refund or replacement. It’s that simple.